Heartleaf milkweed (Asclepias cordifolia) in the Dakubetede roadless area in the foothills of the Little Applegate Valley in southern Oregon. 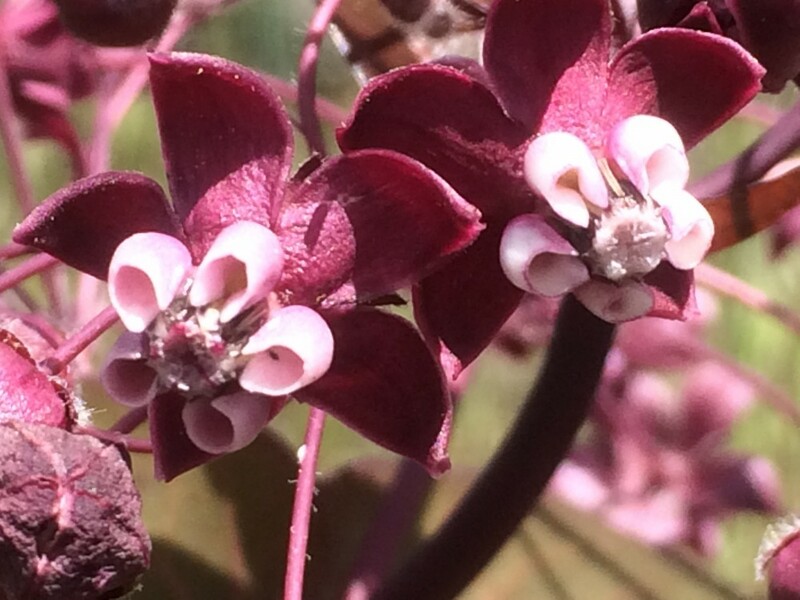 Close-up view of heartleaf milkweed (Asclepias cordifolia) flowers. Monarch butterflies have been making their way through the Klamath-Siskiyou for over a month now. They have made their way from their overwintering grounds on the southern California coast along their ancient migratory path. 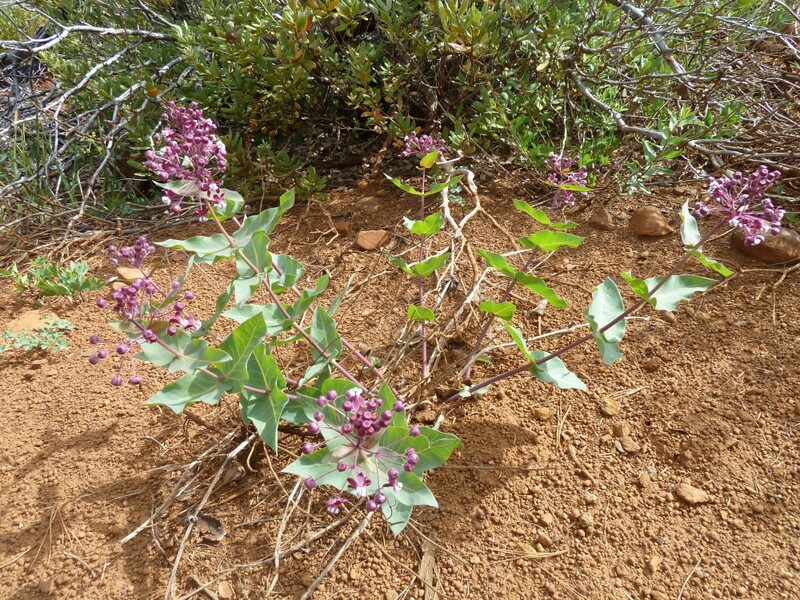 On April 18, 2015 I saw the heartleaf milkweeed, or Asclepias cordifolia (ASCO), in full bloom in the Kangaroo Roadless Area, south of the Red Buttes Wilderness, and just above the Klamath River. With this first sight of the season of blooming milkweed I knew that the monarchs would soon be on their way. 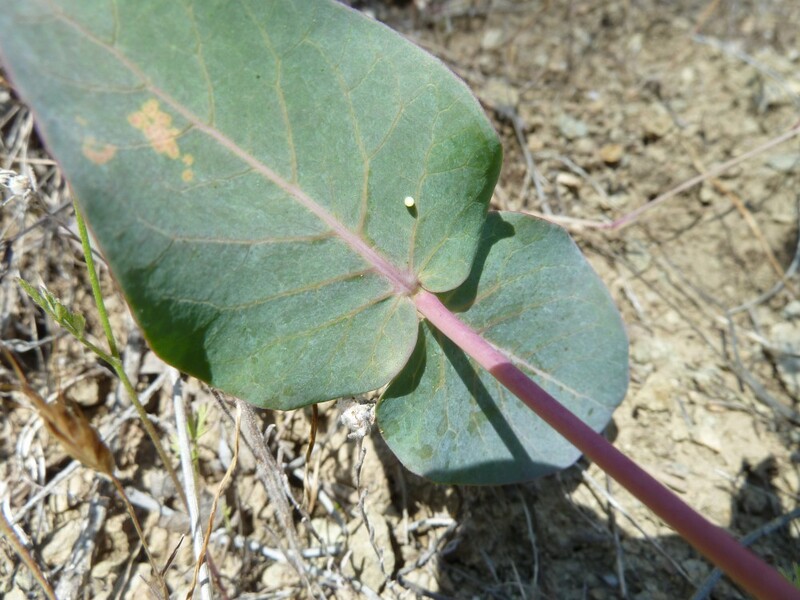 I was not sure, however, if monarchs use ASCO within the Klamath-Siskiyou range, as I hadn’t come across any literature to show it does (that doesn’t mean it doesn’t exist, I just hadn’t seen any). I had a mission: find and document proof that monarchs use ASCO plants in the Klamath-Siskiyou bioregion. ASCO populations tend to be more scattered and remote than the more familiar showy milkweed (Asclepias speciosa) and narrowleaf milkweed (Asclepias fascicularis) that are common in the lower elevations and valley bottoms of northern California and southern Oregon. Just a week later, on April 29, 2015 I observed the first monarch eggs laid on a showy milkweed patch in my garden. The monarch chose to lay her eggs on the less mature and smaller plants within my milkweed patch. As the eggs hatched I have brought the tiny caterpillars into a rearing cage to allow them a safe place to develop. Once they emerge from their chrysalis as a butterfly they will be tagged for monitoring purposes and released back to their wild migration. Currently I have 18 caterpillars in the rearing cage. They eat milkweed endlessly and need to have the cage cleaned of their “frass” a couple times a day. They are so much fun to watch and observe. I have given 12 caterpillars to two other monarch advocates associated with the group Southern Oregon Monarch Advocates, who are helping make sure the vulnerable caterpillars have a secure place to mature. I needed the help, as raising caterpillars is no easy task. Out of the 104 eggs initially laid there have been 30 caterpillars to make it. Predation is a very serious issue for monarchs, with wasps being a very big threat—well, besides human threats, but that’s another story. 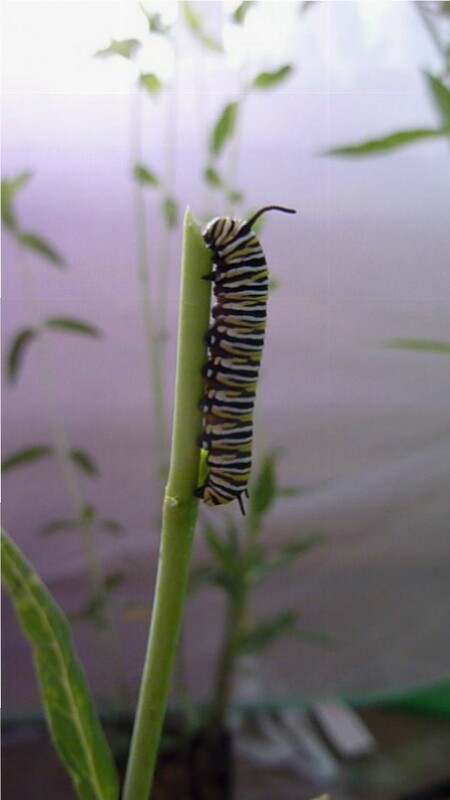 To see more you can watch my Youtube video of the caterpillars moving around on milkweed plants within the rearing cage. Monarch caterpillar eating a stem of milkweed in a rearing cage. 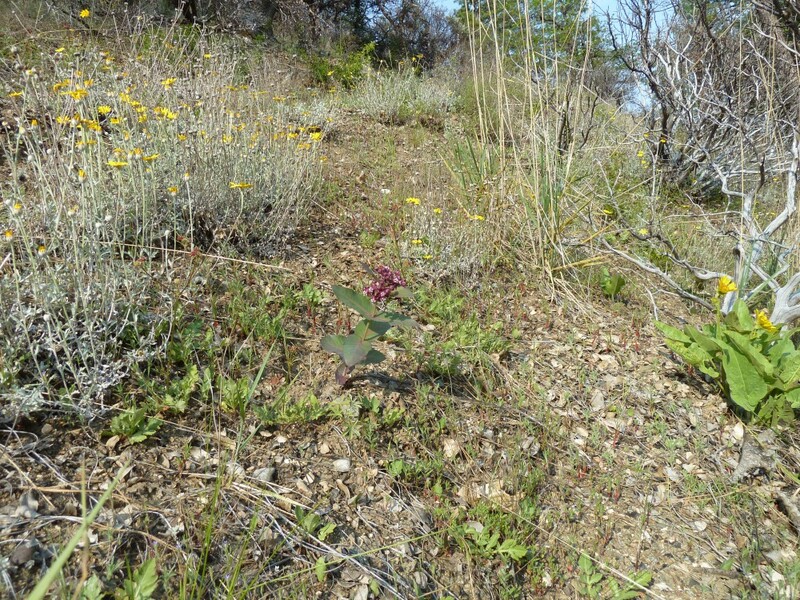 On May 15, 2015 I visited the Kalmiopsis Wilderness where I observed another patch of flowering ASCO. This patch was quite extensive, but it was also isolated; I didn’t observe any ASCO anywhere else on an overnight backpacking trip in the area. I searched the ASCO up and down for any signs of eggs or caterpillars and didn’t find any. Because I knew that monarchs had already started to lay eggs I was disappointed not to see use of this big ASCO patch. Heartleaf milkweed (Asclepias cordifolia) in the Kalmiopsis Wilderness on serpentine soil. The Upper Applegate Valley of southern Oregon also has some isolated plants of ASCO. I was able to visit a couple of these plants and they too were devoid of any monarch activity. At this point I was starting to doubt that monarchs use ASCO plants. 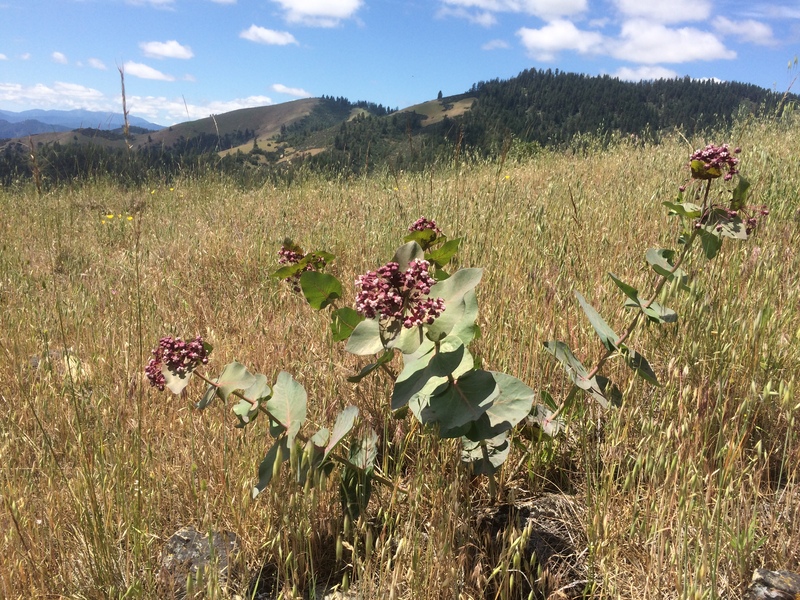 On June 4, 2015 I finally found what I had suspected: monarchs do use Asclepias cordifolia in the Klamath-Siskiyou area! I was able to document through photo and video monarchs ovipositing on ASCO in the Dakubetede roadless area in the Little Applegate Valley of southern Oregon, an area that the BLM has identified as “an area with wildland characteristics.” I knew of a population of ASCO located on and near a rock outcrop on a south-facing spur ridge. The rock outcrop is surrounded by sloping grassland with oak woodland and mixed conifer forest nearby. Check out the Youtube video I made about this experience by following the link below. 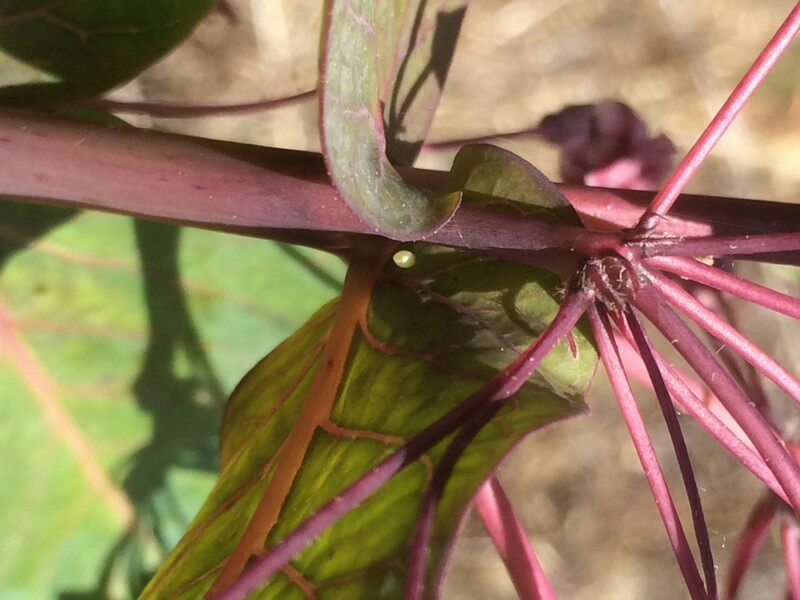 Bottom of Heartleaf milkweed (Asclepias cordifolia) flower with a monarch egg in the center of the photo. 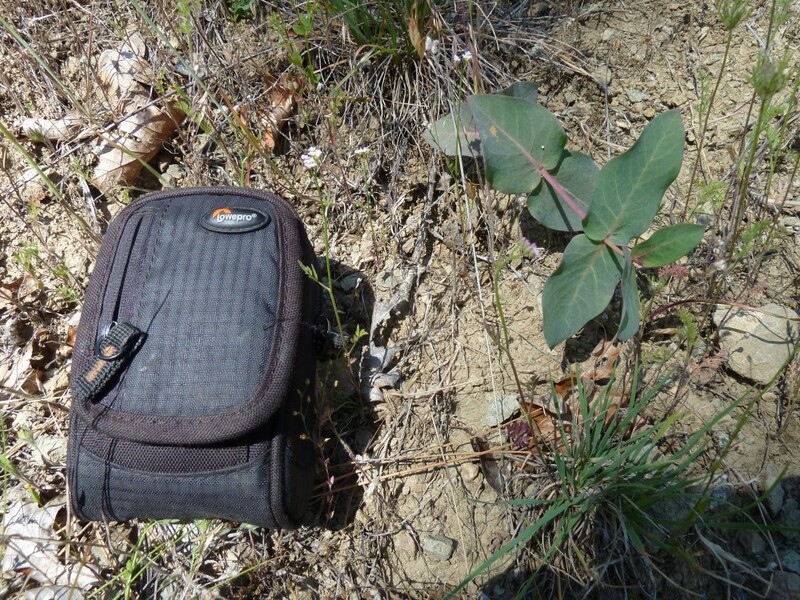 Heartleaf milkweed (Asclepias cordifolia) with monarch eggs on a leaf and with camera case for scale. This was the small size of plant that the monarch was ovipositing on. When I posted my Youtube video I noticed that someone else had just posted a video showing that monarchs use ASCO in the Sierras, near Emigrant Gap. That video was posted on May 31st, 2015 and can be viewed here. My hunch was right: Monarchs use ASCO plants as they migrate through the mountains, in between stops at milkweed patches in the valley bottoms. This milkweed species that is adapted to a more rocky, exposed and mountainous habitat sustains the monarch through the mid- to high-elevations along its ancient migratory path. Plant milkweed in your garden or yard for monarch butterfly recovery. Wild patches have become more rare and should be protected!